To the casual observer, the coin you see here is “just” another gold coin, albeit one with a striking design. But what sets this apart from other gold coins? Why did this one sell out its entire edition limit in just over a month? The coin’s beautiful design has proved incredibly popular with collectors and that design also encompasses a numismatic first, making it even more collectable. The coin combines micro-engraving, laser frosting and traditional engraving – the first time these techniques have been used together on a coin. Collectors love a first, whether it’s a first coin from a new monarch’s reign or a new design feature that could be used on countless coins in the future. 2015 is a special year for Canada as they celebrate the 50th anniversary of their flag. The maple leaf, which features so prominently on the flag, has been used on a number of coins this year and collectors have been snapping them up. 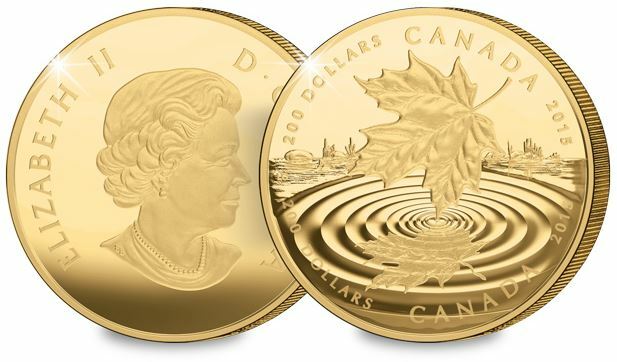 This latest coin – probably the best design I’ve seen – combined with the never-before-seen minting techniques and increased interest from Canadian collectors saw this coin sell out very quickly. Just 350 coins were made available for worldwide distribution, which was clearly never going to be enough to satisfy demand. These three factors, along with the fact that it was struck from pure gold to a proof finish, helped to create a coin that sold out very, very quickly. Of course, I wouldn’t be doing my job if I didn’t pre-empt this coin selling out, so I’m pleased to announce that I was able to secure 20 for Coin Portfolio Management clients. They are almost certainly the only 20 available in the UK and perhaps anywhere. Click here if you want to add one to your Portfolio before they’re gone. ← Are investors eyeing up silver coins?